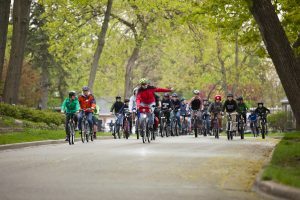 On May 4th thousands of students across Michigan strapped on their helmets and participated in National Bike to School Day (B2SD). Despite some less than ideal weather, students were determined, joyful, and ready to rock. 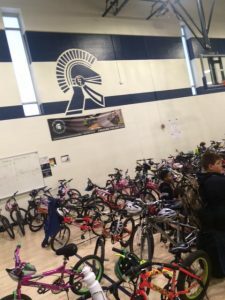 The Michigan Safe Routes to School (SRTS) team had a chance to visit and participate in just of few of these events, and boy did they have fun! Here are some highlights from the day. The scene at MacDonald Middle School in East Lansing is hard to recapture in words. As the sky threatened to spill at any moment, student after student rode up on their beloved cruisers or pulled mountain bikes out of the backs of cars and raced them through the school entrance. Gym teacher and health champion, Terri Cregg, ushered students into the gym where a host of parent and teacher volunteers including, ride organizer and expert cyclist Thomas Baumann (check out his video of the event) slapped make-shift nametags on all the bikes so students would not get confused in the pack. 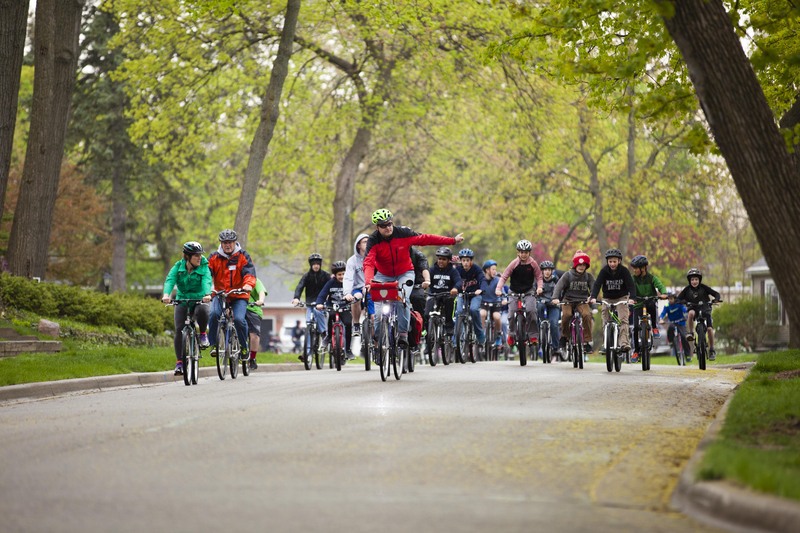 The plan was simple: the 200+ MacDonald students would celebrate B2SD by riding en masse to the Michigan State University Duffy Dougherty building, where they’d participate in All Children Exercise Simultaneously Day with 800 other elementary and middle school students. 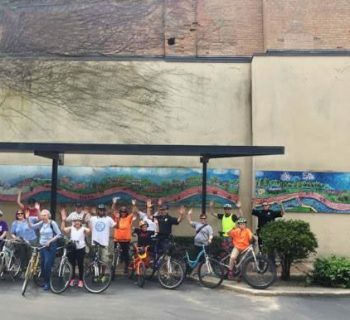 SRTS Grants Manager, Katie Johnson and Operations Coordinator, Mariama Lockington got a chance to join the fun, and by 8:30am had positioned themselves toward the back of the bike train at MacDonald to support students along the way. 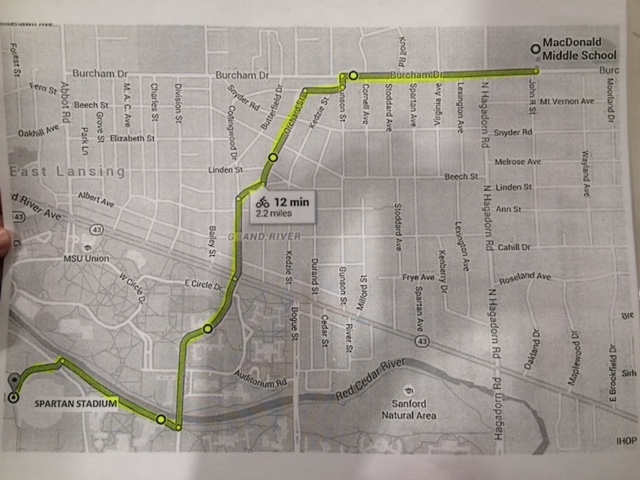 By 8:45am the East Lansing police escorts were in place and the ride was on! Of course the moment students pulled out of MacDonald’s campus it started to rain, but this did not dampen the spirits of anyone. Two sets of 8th grade boys riding tandems cheered as they wobbled to find their balance in the pack and eventually synced up; another set of boys had adorned their helmets with spikey-Mohawk inspired covers and zoomed ahead to the front; a group of 7th grade girls sporting impeccably decorated pastel-colored cruiser bikes glided by laughing and singing. As the group made its way down Burcham Drive, groups of elementary students from a nearby campus gathered with their parents to cheer the middle school students on. 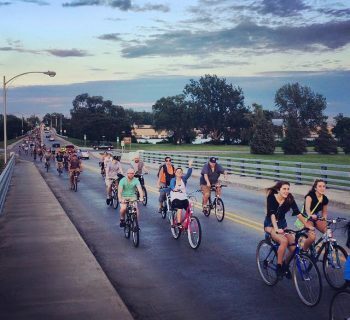 One very small girl at the sidelines jumped up and down clapping her hands yelling “THIS IS THE MOST AMAZING THING I’VE EVER SEEN!” as the 200+ bikes whizzed by. And it was an amazing sight to see. 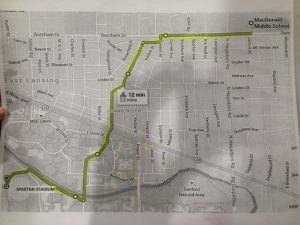 The pack wound its way through residential neighborhoods and eventually crossed Grand River, heading into the MSU campus where cars honked in support as students made it to the end of their 2.2 mile ride and parked their bikes outside of the facility. In the end, the students had a blast and besides a few flat tires, a wayward pedal, and some general exhaustion on the way back, all the MacDonald students made it back to school safe and sound with a very successful first bike to school day under their belts! SRTS Director Meg Thomas Ackerman joined students in Traverse City, where 13 schools participated thanks to the organization Norte!. 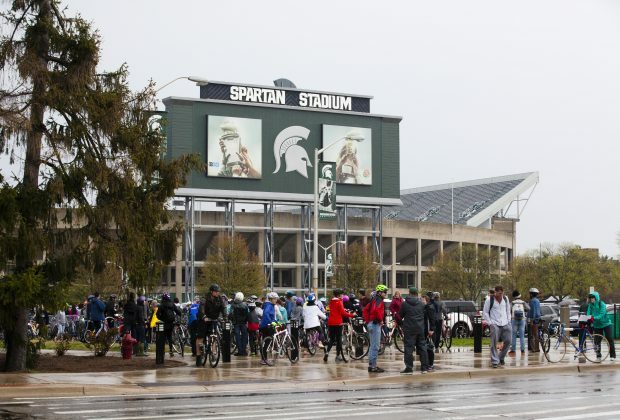 The weather up north was not any better than in East Lansing, but again students championed the elements and brought their smiles and raincoats. Meg met one of the bike trains at the home of Norte’s Executive Director, Ty Schmidt, and rode to Eastern Elementary school with students. 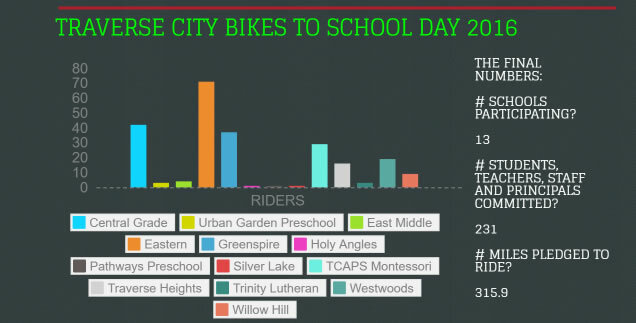 Here, she witnessed a small bike train that grew tremendously with students and parents joining along the way as it snaked its way to school. Principal Biz Ruskowski, donning her rain gear, joined the train as did Steve Brown, founder of the Iceman Cometh race. One of the youngest participants was an intrepid kindergarten girl sporting raincoat, rain boots, and a Frozen backpack – she has been riding the bike train all spring! Oh we will, Officer Martelle! 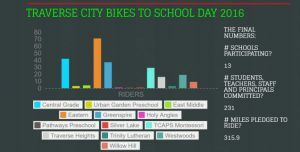 These are just a few of the highlights because this year 200 schools participated all over the state making it Michigan’s most successful Bike to School Day yet! We can’t wait for next May, in the meantime we’re gearing up for Walk to School Day in October. Know a school that might be interested? Get more information here.